Conversion of natural habitats into urban landscapes can expose wildlife to new pathogens and alter transmission processes. Because pathogen transmission is generally difficult to quantify in wildlife, mathematical models paired with field data can help select among competing transmission mechanisms that might operate in urban environments. 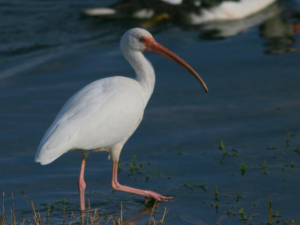 CEID member Daniel Becker, along with CEID members Sonia Altizer, Richard Hall, and Claire Teitelbaum, developed a mathematical model for the enteric bacteria Salmonella enterica in white ibis (Eudocimus albus) in south Florida, where many of these birds have become sedentary in urban parks. They used this system as a case study to determine the relative importance of contact-based versus environmental transmission and whether transmission can be supported by the focal host species (i.e., ibis only) or requires external sources of infection (e.g., other bird species). Given sparse temporal replication, the authors developed a new protocol to explore parameter space with Latin hypercube sampling, restrict outputs by observed infection prevalence over a single non-breeding season, and cross-validate parameter estimates against an independent year of data. This procedure revealed most support for transmission from environmental uptake rather than between-host contact and that ibis–ibis transmission alone could maintain low infection prevalence in urban habitats. This study provides the first parameter estimates for Salmonella shedding and uptake in a wild bird and provides a key starting point for predicting how ibis response to urbanization alters their exposure to a multi-host zoonosis. More broadly, this work provides an analytical roadmap to assess transmission routes of multi-host wildlife pathogens in the face of scarce infection data.